Press the Sauté button on the Instant Pot, and add oil to pot. Add sliced sausage, and sauté for about 5 minutes or until browned. Remove sausage to a paper towel-lined plate and reserve. Add 1/4 stick butter to Instant Pot, along with chopped seasoning blend and garlic, and cook until onions turn soft and clear. Add cooked sausage back to pot, along with the beans, water, and bay leaf. Stir. Turn Sauté mode off. Cover, twist to lock the lid, and turn the valve to sealing. Press the Manual button and set to 40 minutes at high pressure. Total time:1 hour. Prep time:10 minutes. Cook time:50 minutes. Yield:6-8 Servings. Firm smoked sausage will hold its shape during cooking, but softer sausage may not. If you prefer, you can wait to add the cooked sausage back to the pot after the beans have finished cooking. No soaking is needed if you cook the beans for 40 minutes at high pressure. If you do soak your beans, cut the cook time in half (20 minutes at high pressure). Always let the pressure release naturally for at least 20 minutes. This should ensure soft beans. 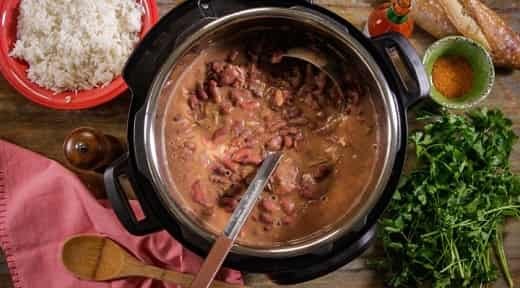 If the beans are not soft after 40 minutes of high pressure cooking and 20 minutes of naturally releasing pressure, then re-secure the lid, seal the vent, and cook for an additional 20 minutes at high pressure. Recipe courtesy of Camellia Brand. Used with permission.